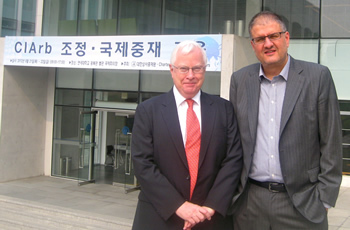 The Korea chapter of the CIArb was launched in May 2012. The founding co-chairs of the chapter were Benjamin Hughes, head of international arbitration at Shin & Kim, and Nohyoung Park, Dean of the Law School at Korea University. 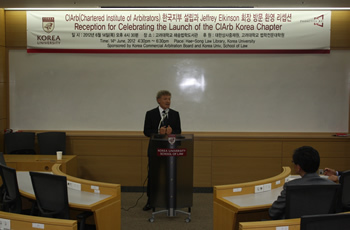 The chapter grew quickly and had already held four events as of the end of June 2012, including a reception for CIArb President Jeffrey Elkinson, a presentation on the use of technology in arbitration, and introductory courses on international arbitration and mediation. 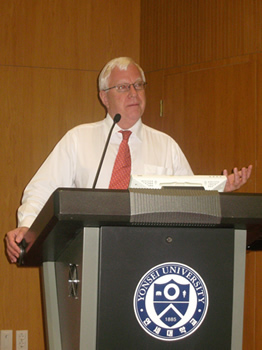 Hughes said there is great potential for growth of the chapter in Korea, as it has a very active arbitration community and a high level of interest among students, in-house lawyers and attorneys in law firms. Korean companies have been involved in several high profile arbitrations around the world, and in 2012 the Korean government received notification of the first ICSID claim ever to be filed against Korea. This raised awareness and interest in international arbitration, and the CIArb is best placed to help address the need for in-depth education about arbitration in Korea. The current Convenor of the chapter is Ms Seungmin Lee of Shin & Kim.